Anyone eavesdropping on the fourth act of Thomas Ostermeier’s An Enemy of the People might be forgiven for thinking that a vociferous public debate was taking place in the Barbican’s theatre. The German director’s take on Ibsen does not provoke discussion so much as demand it. For once, the audience – the people – are asked for our opinion. Well, sort of. From the outset, Ostermeier’s interpretation is a decidedly 21st-century one. Well-intentioned scientist Dr Stockmann, younger than we are used to seeing him, is a leather jacket and jean clad member of the left-leaning intellectual class, with a cover-playing band and the last, frustrated vestiges of radical student politics. In dramaturg Florian Borchmeyer’s streamlined version of the text, a number of periphery characters have been cut, leaving Stockmann with just a young wife and baby son. He is, in other words, the epitome of 30-something reluctant bourgeoisie, struggling to reconcile his political principles with his desire for wealth and stability. The same goes for many of the other characters, who are invariably caught between radical idealism and murky compromise. The bourgeois subjects of Ibsen’s plays translate remarkably well to a modern setting, delineating all the same middle class anxieties and hypocrisies that get regularly dissected today. When Stockmann discovers that the water feeding his town’s prosperous spa is riddled with disease, it is compromise and hypocrisy that win out, as one by one the local politicians and media agree to a self-serving cover-up. Even hipster journalists and fellow band members Hovstad and Billing relinquish their superficial ideals, which turn out to be just another designer accessory. Only Stockmann holds firm, intending to oust the conspiracy at a public meeting. And here is where the otherwise familiar route takes its most startling turn. Partway into the scene, Stockmann’s usual rant segues into excerpts of French anarchist call to arms The Coming Insurrection, before the already dissolving fourth wall is entirely dismantled and we are invited to share our own political gripes. On the night I attend, perhaps unsurprisingly, the Scottish independence referendum and media bias are high on the agenda. Another lone, angry cry laments that we can’t put aside our differences and unite against the forces of capital that we have just heard so passionately condemned. If this open forum elicits anger, then it yields embarrassment in equal measure. Uncomfortable laughs ripple around the audience, as does over-enthusiastic applause in response to statements like “stop tax avoidance” and “get rid of bonuses”. The problem, of course, is that we hear from those – like Stockmann – in the vocal minority. That’s not to mention that Barbican audiences for foreign-language work tend to have a fairly particular class and political make-up. We are no more “the people” than Ibsen’s privileged representatives are. The other problem is dramaturgical. 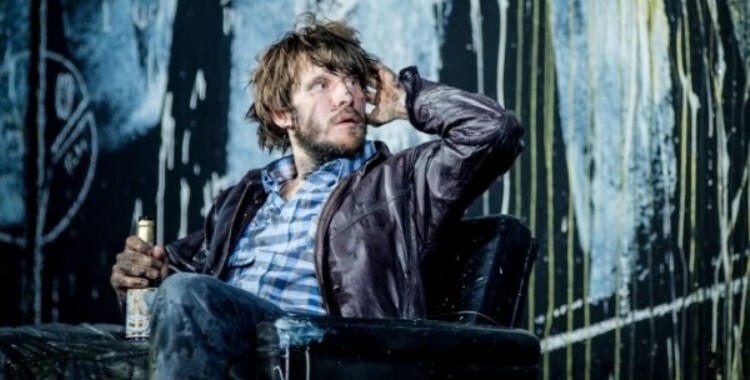 Unlike the outraged townfolk who usually hound Stockmann off the stage, the Barbican audience is largely in favour of the statements he puts forward. This is partly down to the crude measure of raised hands, which do not really allow for ambivalence. I suspect I was not alone in cheering many of the complaints against capitalism but feeling a whole lot more suspicious about the anti-democratic bent of much of what Stockmann suggests. But largely, the crowd is with him. Which rather scuppers the rest of the play. The retreat back into Ibsen’s world, while brilliantly signalled by a pelting of paint balloons from the town Mayor and his cronies, feels like a dramatic anti-climax after the heady debate of the public meeting. Ostermeier and his cast keep the play on track, making allowances for the shift in public opinion, but it never regains quite the same tension or resonance that it had previously. Only in the concluding moments, which have been tweaked to offer a bleak final flourish, does something of the earlier boldness and mischief reappear. There is an implicit question, both in this ending and throughout, over whether it is the blindly self-interested town majority or the political and economic system in which they participate that is Stockmann’s real barrier. Does the problem lie with people or with systems? Here, it seems to me, lies one of the central tensions of Ostermeier and Borchmeyer’s version, tangled up with the question mark raised over democracy. Stockmann might blame the “liberal bloody majority”, but the text that has been spliced into his speech offers an excoriating critique of capitalism and the cult of the individual. So how are we to read it? While Ibsen’s use of Stockmann as the ultimate individual and The Coming Insurrection’s attack on social atomisation appear to be at complete odds, I wonder if there’s something more interesting going on in this juxtaposition. The contradiction between this anarchist manifesto of sorts and Stockmann’s belief that it is a few righteous individuals like him who should hold the power reflects a similar contradiction among Ostermeier’s intended audience – one that is immediately reinforced by the overwhelming support that Stockmann’s speech gathers in the auditorium. Firm belief in the correctness of one’s personal politics wrestles with the ideals of equality and democracy. There is also a fascinating way in which the whole production complicates the notion of the individual. One segment of The Coming Insurrection, protesting the appropriation of the phrase “I am what I am” by advertising giants, acts as a sort of gloss for Ostermeier’s interpretation, projected onto a screen that comes down in front of the action. Even the self is not safe. And Stockmann’s own view of himself and his stand against injustice is coloured with personal vanity, a vanity that is present in the self-consciously stylish aesthetic of the production. Jan Pappelbaum’s design is all fashionably minimal furniture and elegantly limited colour palettes, carelessly cluttered with items of expensive technology. Even the music played by Stockmann’s band – reworked versions of David Bowie and Gnarls Barkley – is something of a pose. The blackboard walls, meanwhile, are a blank slate for ideas, but they are just as easily whitewashed by the powers that be. And then there’s that public debate. Nowhere is Christoph Gawenda’s Stockmann more giddily drunk on his own rhetoric, breaking out of the previously delicate naturalistic acting style of the production and into something far more overtly performative. His speech is as much about him as it is about the ideas he is articulating. The interestingly flawed structure of this open forum, meanwhile, speaks to the limited systems in which both Stockmann and his audience are trapped. Discussion is quickly closed down because the structure cannot hold it, a collapse that feels like as much of a comment as a straightforward theatrical failure. Seen in this light, the problems I held up earlier take on a far more interesting character. Like Ibsen’s plays, it strikes me that Ostermeier’s production is both about and for the middle classes. The Barbican’s audience might not be “the people” in any representative sense, but it is that audience and its counterparts around the world at whom this version is squarely aimed. Here, hypocrisy penetrates all levels of the drama, as even systemic critiques rest on an unacknowledged belief in the individual – a belief that eventually strangles political conviction. Ultimately, what Ostermeier throws out to us is not a liberating opportunity to speak up, but our own inability to effect the change that we debate so passionately in our nicely appointed living rooms.